Coming out of the cold into a warm Holy Sepulchre, to be greeted by members of the front of house team, suitably attired in period costume, created just the right atmosphere for what was to be a superbly entertaining evening. The simple but effective setting and brightly coloured English landscape backdrop evoked the period and for some reason reminded me of the ‘Strartright’ shoe advert with the children walking, hand in hand, down the ‘Golden Pathway’. This truly was an ensemble piece, each actor defining expertly their key role and taking on the different characters of the people they were working for across the various farms. This was particularly evident with the singing, in perfect harmony, with songs that evoked memories from home or their past. The ingenious use of props, the change from ‘civy street’ to land army uniforms worked very well. In particular the threshing machine scene using boxes to give the different levels was particularly effective and very funny. 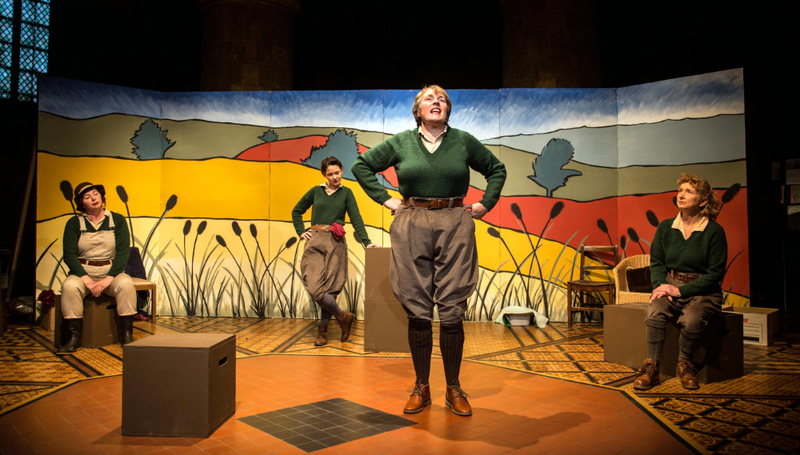 This play and the production works perfectly, witty, funny and sometimes bitter sweet to take us through the lives of four young volunteers during our countriy’s darkest days, the war years. Their hard work was an important contribution to the war effprt learning farming from scratch, the joy, fear and fun times, and how different this was to their home background. Some would say that these ‘were the best years of their lives’. 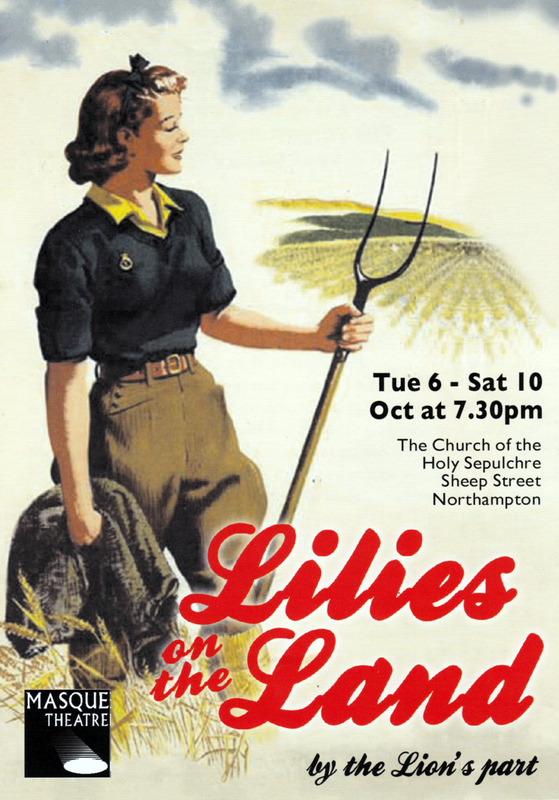 The second act continued the path of these four land girls, with the addition of some darker moments in the story along with the invasion of the American GIs and unwanted advances of the billeted POWs. There were also some very funny moments connected with that of the more down-to-earth livestock farming procedures. Well done, Jen, Sarah, Hannah, Liz and Ursula along with backstage and FOH, a superb evening’s entertainment. From the 'off' we in the audience knew we were in the hands of consummate professionals - by which I mean absolutely everyone in the company. We were treated to real professionalism and the fruits of such a hardworking and totally prepared cast. The characters were completely believable and three dimensional. As storytellers the actors were superb: we could all 'see' their tales. we knew what the farmers, farmhands, service people and POWs looked and sounded like - to say nothing of the animals...! Moments like the account of the singing of Silent Night and the news of the death of their friend on the railway crossing had us all completely 'stilled'. My aunt was in the WLA and now I know something of what her experience was like and for this I thank you all. Thanks for a great theatrical event. It is January, 1965. Four very different women, each in her own home, hear on the radio the news of Winston Churchill's death. 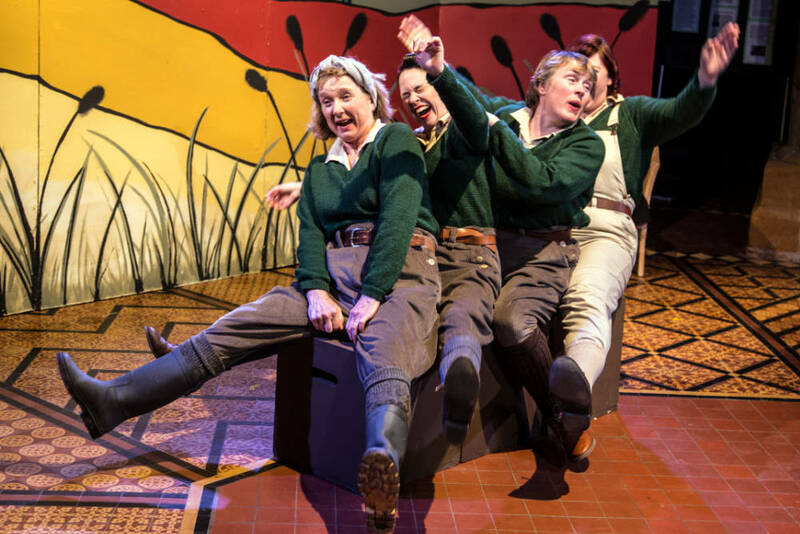 They recall the moment 25 years previously when each took the life-changing decision to defy family and convention by joining the Women's Land Army to do her bit for the war effort. We travel back in time with them as they bring to dramatic life the comedy, frustrations and triumphs of their war-time experience. As well as the central characters, the cast of four play 30 minor roles ranging from a suspicious farmer's wife to American GIs, from lovesick Italian prisoners-of-war to an authoritarian hostel warden. 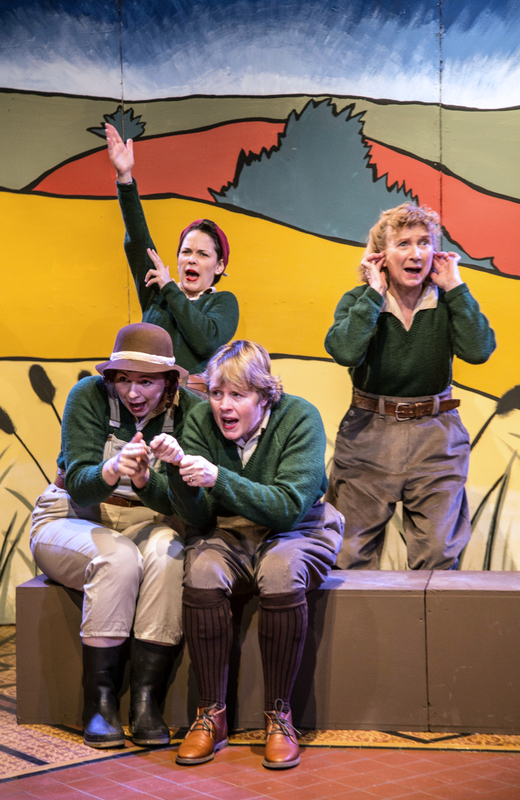 The changing seasons and the rhythm of the farming year, the hardship of the unfamiliar tasks and basic conditions, the songs and dance music of the time and above all the companionship of the women are captured in this warm and evocative play. Based on letters, interviews, anecdotes, songs and poems from ex-WLA members and their families, the play was devised and first performed in 2001 by the Lions part, toured the UK and subsequently transferred to the West End in 2010. This production is directed by Ursula Wright who also directed the Masque 80th Anniversary Gala performance at the Royal Theatre in October 2012. Other Masque Theatre productions by Ursula include All's Well That Ends Well (2013), Dancing at Lughnasa (2011), Oh What a Lovely War (2007), A Christmas Carol (2004), As You Like It (2003), The Prime of Miss Jean Brodie (2001), The Herbal Bed (2000) and The School For Scandal (1998). Between 1998 and 2011, Ursula was the director of Masque Youth Theatre.